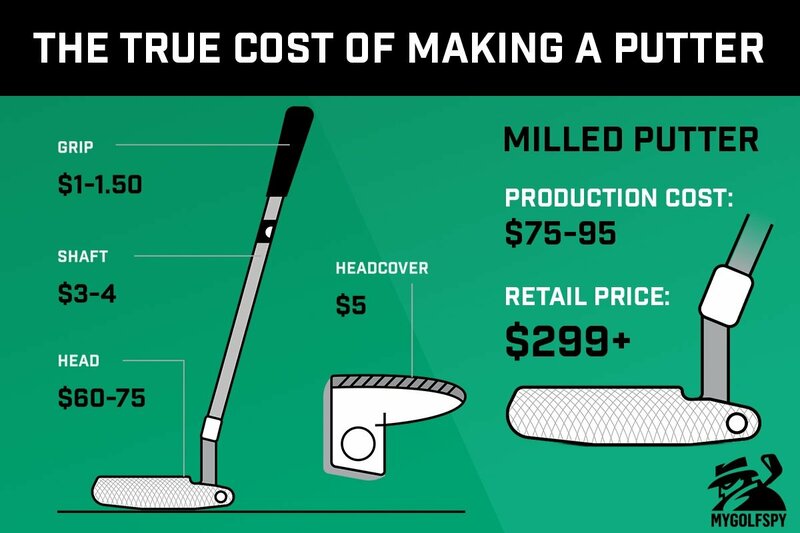 How much did your putter really cost to produce? The answer may surprise you. Milled putters. The term is often leveraged to imply some element of credibility or superior craftsmanship within the putter world. OEM taglines are littered with self-proclaimed superlatives…”premium, perfectly balanced, state of the art…” And as is often the case, a premium story is often coupled with steep, bordering on extravagant, price tags. Many OTR (off-the-rack) milled putters push the $400 threshold while custom, one-off, prototypes and limited-edition collectible milled putters can quickly push north of $1K. 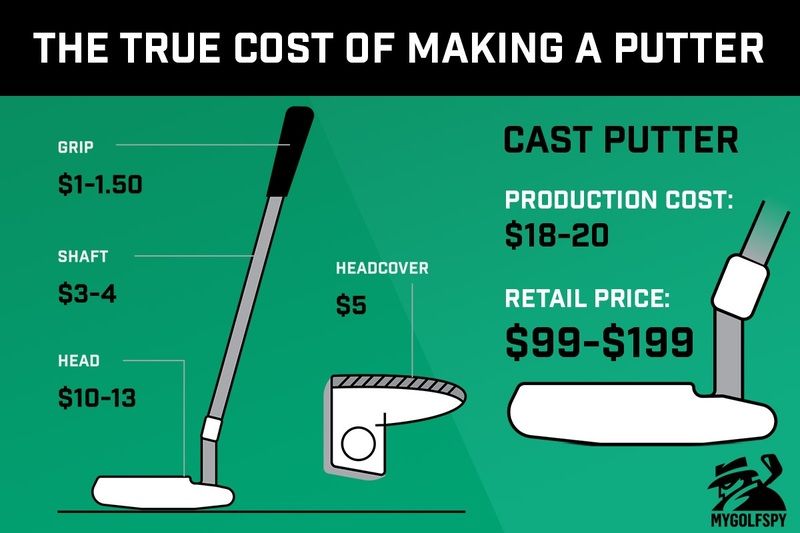 But what does it really cost to make a putter? An unfinished, one-piece milled Anser style head from a first-tier milling operation will run $60-$75 per unit. Most begin with a billet of 303 stainless steel. The “303” version of stainless steel was developed specifically for use in milling and machining operations. As a point of reference, a 12-lb billet block can produce two, one-piece putters. Should a putter require separately milled pieces (e.g., neck and head) which then must be welded together, production costs can increase by $15-$30 depending on how much additional raw material and labor time is required. That said, a basic, one-piece milled head which doesn’t require copious amounts of engraving or intricate milling operations, will typically fall into the bottom half of this range. Carbon steel is a natively softer metal than 303 stainless, and though the raw material cost is less than half that of stainless steel, the lack of chromium makes it more prone to rust, and thus it requires certain finishes which bump the cost back up to roughly the equivalent of a basic 303 stainless steel head. The most expensive putters to mill are those with multiple materials, intricate designs (including milled or machined grooves and face inserts) and adjustable weights. For example, interchangeable tungsten weights increase the cost by $4-$5 per weight. Assuming a design calls for the full complement of options, the per unit cost could exceed the aforementioned $75 threshold, though it wouldn’t be representative of the majority of milled putters consumers see on the floor at the local big box store or green grass account. Most OEMs are looking to minimize costs of production, not increase them. The $60-$75 range factors in larger production runs which take advantage of economies of scale but does not account for polishing, plating or other work which must be done by hand (stamping, paintfill, buffing) to finish the putter. While each of these steps varies in cost, it’s rare for more than $15-$20 to the baseline production cost. Toss in those separately milled pieces (body, neck, inserts) and per unit costs could reach as high as $120-$130, though this is rare for most mass-produced models. As stated, the sole purpose of 303 stainless steel is to produce milled and machined parts and products. Its element structure doesn’t vary based on where the steel is manufactured or milled. To that end, the notion of a geographically superior product (GSS or German Stainless Steel) is what one industry insider told me is “more a (Scotty) marketing thing than anything else.” Point being, labels like “GSS” and “DASS” (the proprietary process used by Bettinardi) describe a heat-treatment process, where the steel is heated and cooled several times to create a tighter grain structure and purportedly a softer feel – but fundamentally, it’s still 303 stainless steel. 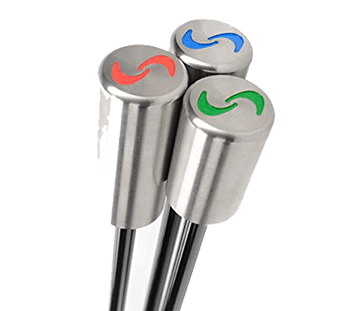 The degree to which an OEM can make a stainless putter feel softer relies upon the assumption that a softer stainless steel putter is preferable to consumers and they are willing to pay a pretty steep premium for this process. It’s also worth noting, several individuals inside the industry with whom I spoke offered the following assertions – “there are much cheaper ways (than heat treatment processes) to make a stainless putter feel soft” and “carbon steel is the preferred material if you want to make a putter feel softer than stainless, but it doesn’t have the same marketing buzz.” Caveat Emptor. Milling is the most expensive way to produce a putter, but it doesn’t unequivocally lead to better performance. Many OEMs also cast putters or use a combination of milled/machined components along with a cast head. 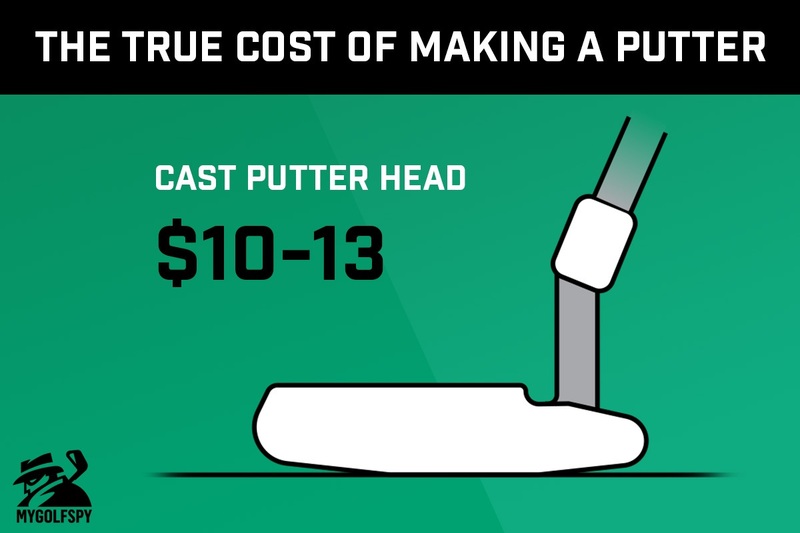 The chief benefit of a cast putter, from a production standpoint, is cost. The same Anser style head which costs $60-$75 to mill barely reaches double digits ($10-$13) as a cast product. Additionally, because many consumers may see a milled face on top of a cast body (referred to as skim milling), it’s easy to assume the entire putter is milled, when in fact it’s not. It’s effectively the difference between a solid cherry armoire and one constructed from composite wood and finished with cherry veneers. Skim-milling adds roughly $5 to the overall cost, bringing the total raw cost for a cast putter with skim-milled face to approximately $18. The shaft ($3-$4), grip ($1-$1.50) and headcover ($5) add an additional $9-$10.50 to the final cost of each putter. Again, costs can vary based on the grip material (rubber, leather), headcover quality (velcro vs. magnet closure) and the size of the production run. Many putters carry an MSRP of roughly 4X the raw production cost. At times, OEMs might offer a limited run of putters made from brass, copper, Damascus or other exotic materials. Production costs in these scenarios can vary widely, and it would be entirely speculative to try and include such situations in this analysis. The way a putter feels and performs has little, if any, correlation to production cost. Milled putters are the most expensive to produce and thus far our testing shows no evidence that putters which cost more to manufacture perform any better than those which cost less to produce. Furthermore, how a putter feels is entirely subjective and is impacted by each factor present in a putting stroke. These factors include, but are not limited to type and depth of face milling (including grooves), face thickness, overall putter geometry, type of face insert, total putter weight and the golf ball. Because of this is far too simplistic to suggest that any type of metal or putter composition is preferable to any other, from a performance standpoint. Putters with labels such as Limited, Prototype, and Tour Only, whether available at retail or on the secondary market, can fetch 2x to 10x the cost of a standard, OTR putter. In general, limited runs of a particular model require a separate milling time or series of finishing processes, which does serve to increase the production cost, albeit marginally. The substantially higher price tag on such putters benefits the OEM to near exclusion. Necessary Disclaimer: Costs referenced are not intended to be exact, and while each OEM will vary within the ranges suggested, the numbers are representative of typical production costs across the industry. Does this information surprise you? What’s your take? What should we look into next? I have to admit that I am guilty of playing a Betti, after reading this that price point that they sell them at is not that significant considering you can buy one for $350 +, I understand that you have to pay all the people that contributed in crafting a masterpiece, and also have to make some sort of profit. Otherwise this was a great article! I have engineered and sold both cast and milled putters, and the unit costs in this article are right on the number. Yet I am at $700+ per? The reason is the putter doubles as a Surveying Instrument, a very difficult CADD accomplishment to say the least. It’s all over ebay as Putting & Surveying Instrument. Great post Bob, very clear and understandable. Most people are not aware of the many machine shops in the US and how many small jobs they perform. Your post addresses the article exactly – the cost to manufacture a putter – assuming the design is done and the manufacturing is done in volume. Your statement about 303 vs. 304 is a little misleading however. 303 has the same Fe, Ch, Ni content as 304, but 303 has the addition of Sulfur. Sulfur makes 303 much easier to mill than 304, but it does lower the corrosion resistance a little. Got to love it . Costs for labor putters Mabey , someone talked about drivers well no labor cost heads made overseas,shafts made overseas so are grips. I’ll bet the average putter head is also made there, got to wonder who is ripping off who. $700.00 for new ping driver,$450.00 for putter this is cost here in Canada. I’ll bet wages are rather on the low side for the product as mass production is in order. Oh ya forgot the millions they pay millionaires to play their product. The article refers to the unit cost of the putter to the Oem.Nothing more. Wow, so a $400 Scotty Cameron is roughly $300 profit. Looks like you are paying a lot for the name. Not true. The ~$100 for the milled putter doesn’t seem to take into account the labor cost and surely doesn’t include the burdens, taxes, and benefits of employees or overhead employees. This cost doesn’t take into account marketing, R&D, shipping, lost items / replacements, office space, work space, or basically any of the cost associated with a company. It also doesn’t reflect the markups on that club the shops receive. Everyone is so quick to make comments (not saying you did) like “you are only paying for the name” etc, but no one ever thinks about the inverse of this. If i were to work for Scotty Cameron I would expect to be paid more that if I worked for Wilson. this also will drive up some of that production cost. If you want to be the best, you have to employ the best. Once you employ the best you have to fight off everyone else from taking them from you. An educated guess here is that the $400 putter comes with a ~$40-60 (10%-18% RoC) markup from the retailer and the same to the manufacturer for roughly 12.5% – 21.5% RoC. These are great or terrible numbers and also could be WAY off, this is just my somewhat educated guess. Making a profit is what it’s all about. Profits pay employees, keep the lights on and allows companies to put money back into R&D. Everyone bad mouths the pharmaceutical industry. And no, I’m not defending the industry. However most people don’t realize what it cost to bring a drug to market. I can’t remember the statistic, but it is something like, for every 10 compounds developed by the pharmaceutical company maybe one actually makes it to market. Not real good odds. The money spent on the ones that don’t make it still cost the company a ton of money and the cost needs to be recouped. As a consumer, everyone has a choice. If people knew the mark up on most all products they purchased they would probably rethink most of their purchases. What about CAD design fees, prototyping, patents, royalties and designer sketches fees, testing…it adds up…OEMs are lucky to make 30% when its all said and done. But…they aren’t the best. It’s pretty much known that they aren’t. I understand it’s subjective, but data has shown they are not from an OTR angle. I’ve got a Scotty studio squareback in the closet somewhere and I dished out much less than retail for a brand new one with custom weights, but it simply does not compare performance wise with my custom ER2. It’s going to be more than 60$ for a 400$ putter. When I bought my Scotty the sales guy told me he had such a high markup on the putter he would throw in an expensive grip and still make a profit. Needless to say I bought somewhere else for $60 less markup and put the grip on myself. That shop still made a profit. And it’s no counterfeit, that’s for sure. Very interesting! How about doing the same type of analysis for iron… forged and cast, hybrids, fairway metals, and drivers…? I wouldn’t spend much more than $150 for a new putter…I also don’t change putters very often…It occurs to me that any extra money should be spent on a proper fitting, which is probably the only way to “buy” a few strokes , whether it’s off the tee, off the fairway, or on the green…I’ve also tried out some $400 putters I didn’t like, and some $100 putters I loved. You can’t really quantify feel. OTR is never the way to go, yet so many at my club and local clubs still continue to show up with OTR clubs. Crazy to me. HUMMMMMM…2 putter heads from a 12lb block of material. I think someone has pulled your leg. I ask a buddy how sells material to production/milling companies for over 15 years. He said any company with that product loss to end product would be a home hobby person. percent of loss is around 5% “SCRAP” at the high end. Of course he went on with all the variables,plate length, clamping method etc. Many companies run sub 1% with all the reuse, recycling methods. PS: my buddy would love to have that account by the way with that product to scrap ratio, 303 stainless is the lower in cost product as well. Maybe I misread your report. on 12lbs of material for 2 putter heads. Did your person tell you why so much waste? Perhaps you’re confusing putter heads with one-piece putters, which is what is stated in the article. A one-piece putter includes the head and the neck and if you know a way to get more than two of those out of a 12-lb block, I have some people who’d love to chat with you. I spoke with my friend about this again. He knows of no manufacture incurring that amount of waste to product weight. He suggested pre-form blocks finished in the mill. He stated one of the big waste products are small engine manufactures at 2%.i.e. weedwhackers, chainsaw motors out of aluminum. Perhaps another example where industry specific production techniques differ. It sounds like your source doesn’t deal in one-piece milled putters as I can assure you, the information referenced in the article is accurate based on production of one-piece milled putters. Thanks for the comments and support. It did sound odd to me as well. For example, a 375 gram head (which is likely around the heaviest?) weighs 0.83 lbs. 330 grams is 0.73 lbs. So less than one lb. Two putter heads would be less than two lbs. I know nothing about how they make the heads out of the billets/blocks, so I’m not claiming any expertise. Just saying it seems odd to need 12 lbs of material to make two heads that would weigh less than 2 lbs, including the head and the neck. Look at the Cleveland Huntington Beach putters. $100 for a putter that is every bit as good as $400 putters. I blame consumers for allowing themselves to be sucked in by marketing hype. I am always amused at the amount of people that scream HYPE concerning just about every golf product. Do you think the majority of people buying a Bettinardi or Cameron think it will help them make more putts than a Cleveland HB? Of course not, they like the feel, the style, the balance, the attention to detail or they just like high end products and yes, some just enjoy the status of a high end product. MGS doesn’t help in this regard and usually fans the flames, as this article is under the guise “true cost” of just giving you the facts Mam, which of course are irrelevant to what a putter actually costs to bring to market. How about the HYPE of the ridiculously large and gaudy milled Carnoustie coin when a penny, nickel or dime will work equally as well? HYPE has to be the most irrelevant and over used term when referring to anything an OEM produces and sells. Golf equipment companies appear to be 90% marketing and endorsements with little if any technology staff. Some countries are very skilled at manufacturing brand name equipment that sells for much reduced price. My experience is that much of this equipment is very good and some actually better than the big names. Say no to higher prices and try some knock offs. I have been in high volume machining and manufacturing all of my life. Retired for the past 5 years after 40+ years in the business. I have a degree in accounting and I was in management although I have run machines when I was younger so I have a pretty good idea of machining, manufacturing and management. Most shops will figure their overhead costs and then calculate a machine hourly rate to cover those costs (based upon the type of machine, the number of machines, and the estimated utilization rate). Think of the ‘shop rates’ listed when you have your car serviced. CNC machining centers (mills) and CNC lathes have typical prices ranging from $50K to $400K+ depending on capacity and special capabilities. The milled putter head out of 303 stainless could be run on an entry level CNC machining center. 303 is one of the more forgiving stainless steels to machine. It is regarded as a free-machining variety. 304 and 316 and duplex stainless steels would have lower machinability ratings due to increased chromium and nickel levels that are added to enhance corrosion characteristics amongst others. I would imagine the raw material in bar lengths would cost in the $6-$7/lb range. The bar would have to be cut to length in an automatic saw which is another processing operation. With today’s improved carbide cutting tools, I can’t imagine that it would take more than 5 or 6 minutes to machine a putter head from solid block. So at 6 minutes, that would give you 10 pieces gross per hour. At 75% efficiency, you would be producing 7.5 pieces per hour. Estimate a $75/hr. (?) machine rate and you have machining cost of $10 per putter head. Add in your sawing cost, material cost and additional processes such as heat treat, polish, paint, assembly with shaft, grip, cover, box, etc. and add your mark-up….20% (?). This is the basic process that most machine shops would follow and everybody has a bit of their own methodology to tweak machine rates, mark-ups, etc. to their particular circumstances. Volume makes a huge difference in amortization rates. I had a Ping putter about 5 years ago which had a metallic foil insert. The foil wore out and I returned it to my proshop to ask if I could get it repaired or replaced. The Ping rep responded that they could not be repaired and were out of production. But they would sell me my choice from their catalogue at 50% of their cost. I chose a Rustler Cadence. The bill came in at $28 Canadian!! This price supports your information on the cost of manufacturing putters. Is putting even important to golfers that call a three footer a gimmie? I have a better question about putting, ” What would you guys pay to cut 5 shots off your game, with either a training system or better putter? Lets see what you guys would you PAY to cut 5 shots off your score…I presume nothing – if you’re picking up three footers! Can I get a vote? AMEN!! Not to mention the fact that the “Circle of Friendship” can vary by course, situation (I’ll give anybody a 3-footer for a 9, but I won’t give you a 3-inch putt for birdie), and how much trash talk occurred prior to teeing off! Please add me to your distribution Email list. Many thanks. This cost analysis is interesting, but a bit simplistic and incomplete. You have cited some, but not all of the direct or variable costs of production, and none of the indirect or fixed costs of production. There are also many other direct costs involved in delivering a product to market than the costs you have cited such as R&D, packaging, promotion, and shipping for a specific product. Then, there are the indirect costs that exist for a business including: rents or leases for facilities and equipment, administrative, licensing, and utility costs. You also haven’t indicated whether the costs cited are the average or marginal cost for producing a single putter, which would be quite important in calculating the cost of production. 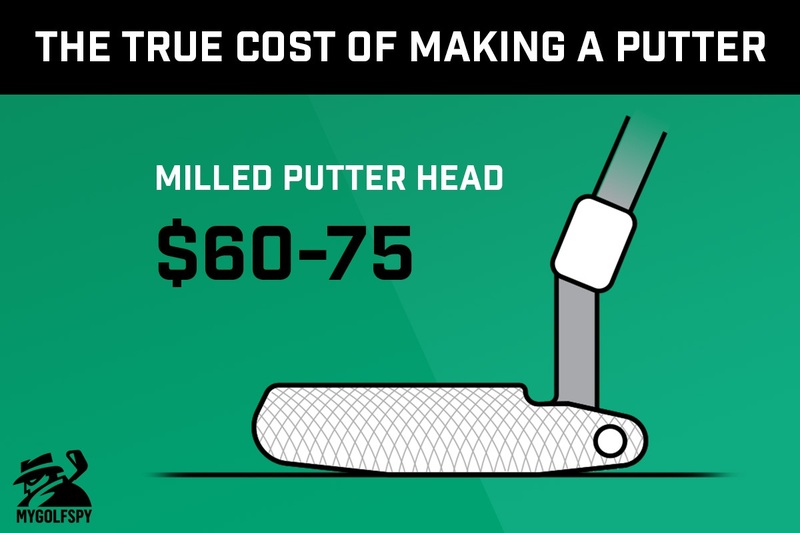 So, the TRUE total cost of a putter is likely NOT the costs you have cited in this article, but it may be the TRUE average DIRECT cost for a putter head to be manufactured. Managerial accounting at its best. Good stuff. As an Econ grad, it’s refreshing the see a good basic accounting analysis. Cheers. Brad – Therein lies a challenge of a single infographic, which is meant to be informational and easy to digest for the majority of readers. Certainly, there are some which would love to enter a conversation around maximizing utility, Pareto optimality and any other number of factors specific to how an individual firm MIGHT operate in this particular market – but my hunch is a small percentage of readers would find that information both interesting and useful. The indirect and variable costs which were not included (many of which you list) vary so widely from OEM to OEM and in included could actually create more confusion than clarity around costs of production. I agree that things should not be over-complicated. However, leaving out crucial information is a lie of omission. An overly simplistic answer that does not provide critical facts leads people to draw incorrect conclusions. Brad – Variable costs which have no impact on direct costs of production are neither critical nor crucial for this limited scope of analysis. Not sure how someone might draw an incorrect conclusion based on the information presented, but then again, I never fail to be surprised by what some of our readers take from otherwise benign information. Thanks for the read. Don’t forget the umpteen dozen pros on staff getting free gear, fittings, etc and the concept that the price doubles for every set of hands the gear passes until it hits retail. Thomas Sowell said it best, (he obviously wasn’t referring to putters but something else) That milled putter doesn’t cost 105$, it cost a million dollars, then 105$. Very interesting, Chris. You give us the facts clearly and concisely, then let us make up our own minds. Can’t ask for more than that. One other cost factor is the freebies that OEMs give tour pros, plus the staffs necessary to cater to the pros’ every whim. Plus the cost of the advertising to convince us that the xxxxxxx is SO MUCH LONGER than the xxxxxxxxx. Plus staffing and provisioning demo days all over the country. But it must be working. Callaway’s stock (ELY) closed today at $18.83; It’s IPO price in 2011 was $5.03. Acushnet stock (GOLF) is up 33% in less than 2 years. Perhaps I missed it, but what is the average cost a shop pays for both subject putters & what is the shop’s profit, from selling just 1, 5, or 10 pieces? Wait, what’s this “shop” you speak of? Golf clubs are getting ridiculously expensive. Which is a shame since it will be detrimental to growing the game. I live in Wichita, Kansas and they have shut down 3 golf courses in the past 10 years. If prices keep going up it is just going to discourage more and more people from taking up the game. All these OEMs are basically digging their own graves IMO. A premium baseball bat=$200. A premium driver=$500. A top level pro could take a 50 year old set of clubs and I would bet money they would beat any good to average amateur with the most expensive fitted clubs in the world. Great article! Caroline is absolutely correct. Golf clubs like to cater to high end players and golf courses. Some make it work. Too many don’t and too many golf courses become housing for the high end players or pastures for high end llama farms. I agree costs are up, but there is a healthy market for used clubs as well (both retail and Craig’s list). I am a 6 handicap and have played used clubs (and balls) my entire life. I don’t spend more than $150 on my irons, $30 for a driver or putter, and $0.50 per ball). I get the equipment that was “the best” 2-3 years ago – so if it looks to be in good shape, how bad can it be? Actually, that is rhis question I would love to see answered here. How much do clubs degrade (or improve) over time. I thought it was interesting how the R&A had to test drivers at the Open for fear they were getting too long. So does that mean I would get more distance by buying a used club, could be better off than buying th new one off the rack? Jeff makes a point that can be applied to most spectator sports(pro basketball, baseball and football) and the average Joe golfer … Cost. I can’t afford to take my family to more than one baseball game a year. I love golf, but the fees of the few decent courses has risen to the point that I can’t golf more than a few times a year. The cost of golf equipment has risen to the point of excess. Attending a pro sporting event or, playing golf at a reasonably conditioned course is becoming “A Rich Man’s Game”. Very sad. Lets not forget, when I started working in the industry in 2000, we had $499.99 drivers, , $399.99 fairway woods, $50.00 balls, and irons that were 800 per set, same price as I sell clubs for in my shop now. Putters have gone way up and bags and shoes have as well. I was looking at an old golfsmith catalog with Payne stewart on the cover, so that tells you how old that is, and those prices were in there. $399.99 Great Big Bertha Ti fairway wood, 800 for steel irons form them and 1299.99 for ti irons with graphite. I think we all suffer from $99.99 rocketballz driver memory from a few years ago thinking golf is getting so so much more expensive. One wonders what percentage of the markup goes to providing free equipment to pros all over the world plus their endorsement fees, not to mention free stuff for college players and their coaches. Don’t forget that athletes from other sports also get freebies. All that might eat into the profit margin. Bingo, you can see why Titliest ProV1’s cost near twice as much as say a Snell golf ball….hard pressed to say cost in manufacturing is more then $1. I am still using an old Ping 60, and my putting is as good or better than the rest of my group and others with whom I have played. No, it doesn’t have a milled face, an insert, or changeable weights, but it’s done the job quite well for 30+ years. That’s all well and good, many have old trusty rusty clubs that we hang onto. But just think what a putter would cost if everyone held onto their putters for 30 years. There’d be 2 putter manufacturers selling putters for thousands. The bottom line is: Manufacturers can spend money on land, buildings, machinery, wages, and all costs, but they are just producing an unnecessary product that performs no better than a cheap $20-50 dollar putter. It’s still in the hands of the player, how much he practices, and how serious he is about improving. The manufacturers can say what they want, but the bottom line is, if people are stupid enough to pay big bucks for their putters, it is just an ego trip to show off what they have in their bag. I doubt scores even with the pros would suffer if they had to downgrade to an el-cheapo putter, after some practice and getting used to it. Save your money people, and put these vultures out of business. Seems you don’t believe the data that MGS does every year on putters. That all the testing and results are just a bunch of BS? I purchased an Evnroll mallet based on what I read here and what it felt like in the store. I’d have to say it performed 300 times better than a $10 putter, saving me many putts the first day out. But if you have unlimited time to practice and paid yourself minimum wage, I think I am still money ahead. Brad no doubt you missed the point that I was being facetious in justifying the cost saying it was 300 times better than a $10 putter, therefore making it 10 times the value. I never settle on any club and each has to earn a spot in the bag. With that being said I have a few Pings such as a PLD3 that putts magnificent. But nobody will ever convince me a $25 putter is of the same quality as ones starting over $100. I believe good putters can make putts with almost any tool, and that deciding on a blade or mallet can make a difference in putts holed because of fit. But a new putter can inspire us to practice more, and change focus. Even changing weighting can alter a putter greatly and tune it to improve areas where someone might struggle. Guerin Rife has spoken volumes about this, and something as simple as a grip change can make a putter feel infinitely better for most golfers. Frank – I agree with your statement that a new putter can certainly inspire golfers to practice more and that a change in and of itself can bring about positive results, at least in the short to medium-term. I also agree that a $25 putter is not going to be of reasonable quality unless the manufacturer is selling it at a loss. My real point was that based on my own testing (not statistically significant I realise), I cannot find any evidence that any particular face “technology” (e.g. Evnroll, Ping True-Roll) makes a measurable difference in my putting results. I think MGS vastly overstates the effect of some club “technologies” and I see no evidence that micrometers of difference in groove milling actually makes an appreciable difference to a golfers score. In fact, I think a golfer concerned about such things is missing the forest for the trees. As you stated, extra practice and confidence standing over the ball will have far, far greater impacts on scores – whatever the cause of that confidence. It’s mostly mental. So, golfers should use whatever putter gives them confidence and inspires them to practice more. Forget about what “technology” it has or doesn’t have. p.s. I notice that my previous comment you (Frank) responded to is no longer showing in the comments. Not sure why that is – MGS? 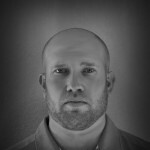 Really interesting article – I’ve wondered about the cost of manufacturing vs retail cost on most golf related articles. We, as consumers, have to understand the manufacturer’s have staff’s to support , from engineers/research, prototyping/test, assembly, sales and support – not to mention the paid players. I don’t think anyone is really surprised by the cost variances, but I enjoyed knowing verses guessing. Appreciate the insightful information. One of the most significant issues is the many, many different models made – just look at the Ping offerings as an example. Many models won’t sell that well and ultimately will be deeply discounted. The ones that do sell have to cover those that don’t. What about the cost to assemble the putter (cut it to length, loft/lie, gripping, etc…)? How about the costs of shipping? It seems like there are some clear gaps in the assumptions made in this analysis. I dunno, I had a club in a cart a couple weeks ago, and the manufacturer was gonna charge me 21.90 to ship it ground, needless to say I purchased it elsewhere, for the same $ and free shipping. Something tells me they aren’t starving. There are a lot of associated costs involved in a business like this. Engineering costs, Patent fees, warehousing, staff advertising and sponsorship. We all know the basics of running a business. If we didn’t pay 4 x the manufacturing costs, the product wouldn’t exist. When you go out to dinner you are paying 4 x the cost of the meal yet you don’t complain and you do it weekly! It happens in all aspects of life. No big surprises here, good report on your findings. Notably absent are the very popular mallet putters with face inserts. My guess is they are cast, maybe have some tungstun, extra weight options, maybe a fancy multicolored enamel paint job. I would be interested to see if the price reflects any overhead costs. This sounds mostly to be cost of materials. It would be interesting to here the same for drivers given the amount of engineering and research they put into these, arguably the most expensive club in the bag in many cases. I worked in the manufacturing/corporate world for 35 years before becoming a full time club guy and I can assure everyone reading this that the material and labor expense to make a product is a small portion of the total cost – especially when their is any type of engineering involved. As an example, a commonly used part on every car engine in America that costs $1.00 – $1.50 to manufacture (labor and materials) will cost you $25 – $35 in the auto parts store, and way more if you have someone else install it! I agree Dan, as a toolmaker with over 45 years experience I can say many of the costs are often over looked in this. A lot of the hidden costs such as R&D, engineering, and fixture building need to be spread out across the production run. Making 10 putters or 1 prototype, costs a hell of a lot more than making a run of 5000. A typical CNC machine with enough balls to mill putters would cost over $50,000 to $100,00 and another 20 grand in tooling. Not to mention software that starts at around 10 grand, and a shop that it can fit into. At the end of the day a putter is only worth what someone is willing to pay for it. If you don’t mind paying extra for top quality manufacturing, fit and finish, you can purchase a work of art. If you are a little tighter in the wallet there are $10 shag bag options available all over. This is no different than paying $75 for a custom ball marker like the ones from CNC Creations. They are a small work of art to some and a waste of money to others, you need to decide what it’s worth to you. Amen to that, Cabin filter on a Honda, $79 installed at dealer, $8 for part and 3 minutes tops to install your self…. Dan – The costs to which I believe you’re referring weren’t overlooked – they simply weren’t included because of how much they can and do vary from OEM to OEM, whereas the direct costs of production, given the stated parameters, do not. Assuming your car part costs are accurate, that’s a 20X – 23X increase from manufacturing costs to retail cost. Putters are, as stated, more in the 4X range. Every market is different and once you start including highly variable costs, it limits the opportunity to give clear information. An anecdote by Thomas Sowell best explains this concept. You see a street artist and ask them to draw you a portrait, they draw the portrait, it takes about 5 minutes, and they charge 100$. You pay the money because it is a really good portrait, but you say:”this is kind of a rip off it only took you 5 minutes.” the street artist replies, 20 years, and 5 minutes. 20 years to master the craft, 5 minutes to make the portrait, this article only focuses on the 5 minutes. If it only cost 105$ to make a premium putter then why doesn’t chris just make himself a putter, it will only cost him 105$ tops. So your 100% right this article completely ignores fixed costs, labor, research, and design. It’s all in what you like, or at least what you think you like, and what the market will bear (consumer confidence, name recognition, exclusivity, etc.). As a poor comparison (and, yes, taxes are involved), depending on your bourbon preference you can pay anywhere from $10 a bottle to nearly $100 a bottle (and more, if you’re extremely selective). But actual production costs range from about $3.50 for the cheap bottle to about $4.00 for the expensive one. My point? It’s kinda nice and very interesting to know production costs but at the end of the day, we’re going to pay what we have to pay to get what we want. Because you use your putter more than any other club, I would always recommend spending to your comfort level for a putter. I can say without too much prejudice that higher end putters clearly outperform budget putters. Still, your technique has to be sound. Thanks to this website and its exhaustive testing especially with putters and drivers, clearly there is a marked difference. I would never cheap out on a driver or a putter. Wedges are next. Quality clubs are clearly better. made my own putter. shaft $10, grip $15, alum face $3, brass weights $4. highest moi putter available and it is a toe up putter, yep, toe up. i always laugh at face balanced putters. there are perfectly balanced if you have a straight up in the air putter. once you put it on the ground the face falls open and the heavier the putter, the more open the face falls. my putter is 450 grams with a 200 gram shaft counterweight. usga conforming. Having been in manufacturing, wholesale, and retail for 40 years, mark-up of “keystone”, or 100%, is the norm for retailers to keep their doors open. If my manufacturing cost was $100, the cost to my distributor would be $125. He would sell it to the retailer for $150. The retailer would keystone the item in his store to $300, which would probably be my MSRP. As a manufacturer, I SET THE MSRP. And if you deviate from that price, I have the power to remove the product from your store. The internet is changing this structure, slowly, but changing it to eliminate “hands” from the products. Everything is wrong about your breakdown. Not surprising at all. However your title states “The True Cost of Making a Putter”; and you’ve left out quite a bit of the cost — be it direct or indirect cost. Looking forward to maybe breaking down some of the cost of marketing and customer acquisition— moreso than rent/mortgage, insurance, etc. Regardless these are all costs. This doesn’t really shock me too much. It might be $105 to make a milled putter all costs in from a manufacturing perspective, but then they sell it wholesale to pro shops, Golf Galaxy, etc. Then those places have to put their markup on it to cover their costs and make a profit of selling it. Good info Chris Tks!!! I totally agree with Kent. 2 putt every green = 36 putts start draining putts and scores will improve dramatically. A $600 putter is not the answer! Spend more time on the practice green!! Put in the work. Rodney Dangerfield’s putter had a light and beeper when he found the line. Ain’t none of those around sooooo, practice!! Very interesting article. If retail is really 4X cost of production that seems perfectly fair. There are other costs, like marketing, shipping, staff, unsold inventory etc. Something has to be left for profit. What’s more interesting is that cast putters are 5X-10X cost. If I was a golf manufacturer I would be trying to build the best performing cast putter I could so I could have a higher ROI. It would be interesting to have MGS look at the existing data and report on whether cast or milled putters perform better. MGS already has the data from recent putting tests, they just have to reorganize it. Indeed, the costs of marketing/advertising, tour staff, etc. all exist and no doubt factor in to the final offered price from the OEM. And this is where I believe our Most Wanted testing is so valuable – because it measures only performance and doesn’t include metrics like “demand” or tour presence. The information should create a meaningful conversation – but as per usual, we’ll see. Can you do a piece on driver costs next? Would love to see how much these $500 drivers cost to produce. Chris- For clarity when I say it seems “fair”, perhaps a better word is reasonable. That’s still a subjective word, but perhaps it removes some of the judgment inherent in the word fair. To the best of my knowledge, an MSRP of a product that is 4X cost will not be setting any records for markup. Golf manufacturers need to make a profit, since this is what they do for a living. Regardless, this was an interesting article. By the way, MGS testing helped introduce me to Evenroll putters, and I’ve added the ER-7 to my bag. Great club, now I just need to learn how to use it better! This is an interesting read to be sure. Marketing and creating an image are things we all seem to be suckers for. This reminds me of my consumer education lesson where a plain Gildan shirt will cost you $5.00. Stick a Nike logo on it then it is suddenly $29.99. Shirts are still the same. At first glance, the double take for a cast putter nearly caused a neck strain. However, you think about overhead, marketing, and G&A expenses associated with running a business, no wonder they have $100+ price points. I wish more companies had the Ben Hogan approach with the direct-to-consumer model to reduce the price. But then again, golfers don’t always buy the cheapest option (i.e. golf balls) available to them. Yes, but how much for machines, employees, insurance, marketing/advertising, shipping, etc…article probably a little misleading. Business 101—cost of product is only one aspect of cost, now you have to buy the land, permits, then a the building, or rent. Then answer the phone, overhead, employees, fixtures, , change to new models, engineers, CNC machines and operators, then comes lawsuit, then cost of replacements and and employees bonus .and where is the profit? Spot on RB! Margins are razor thin in the golf business as a manufacture – thus the consolidation. Gone are the days of the small guy trying to compete – at least for long.